The Fresh Morning Brew Basket is a beautiful arrangement of coffee, coffee accessories and coffee pairings. 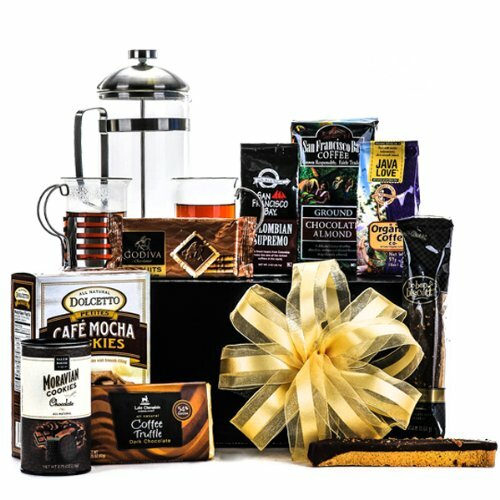 This basket includes a French Press Coffee Set with two accompanying glasses, 2 oz. San Francisco Bay Colombian Supremo Coffee, 2 oz. Java Love Organic Coffee, 12 oz. San Francisco Bay Ground Chocolate Almond Coffee, 1.2 oz. Godiva Chocolate Biscuits, 2.25 oz. English Toffee Flavored BeBop Biscotti, 2.75 oz. Salem Baking Company Chocolate Moravian Cookies, 5 oz Dolcetto Cafe Mocha Cookies and finished with a 3.25 oz. Lake Champlain Coffee Truffle Chocolate Bar.